Amber is our super cute red haired and fair skinned baby girl. She has blue eyes and wears a pretty summer dress with underpants. Her garments come easily off and Amber is a perfect play companion for any small child. The hair is made from strands of pure wool and the ‘skin’ from 100% cotton knit. The product is filled with 100% sheep’s wool and can be hand-washed. The clothing is mostly cotton. Please note: While maintaining a distinct style, due to its handcrafted nature, each doll will vary slightly and fabrics used for the garments are frequently changed. 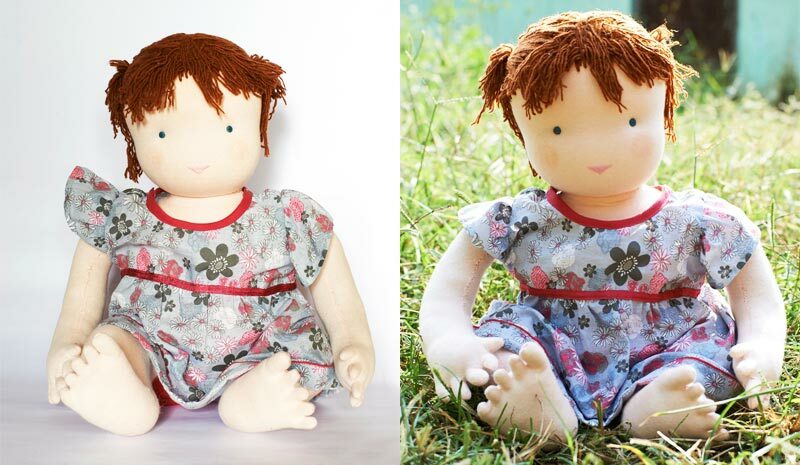 As each doll is made according to your order, we are most happy to exchange the skin, hair and eye colour with any other doll on our website and please let us know if you have any preferences for dress colours. To do so, please fill in the comments section during check out or contact us separately via email at info@dolls4tibet.com.